I've already had some good discussion with Fat32 in this question yesterday. Do I count wrong or are there 5 samples used for the approximation? q+p+1 should be $2+3+1=6$ and therefor 6 perfectly approximated samples. Okay I've calculated it. Due to the periodicity the sixth sample is correct too. But what if the vector would be e.g. 10 at $x$ (sixth sample)? 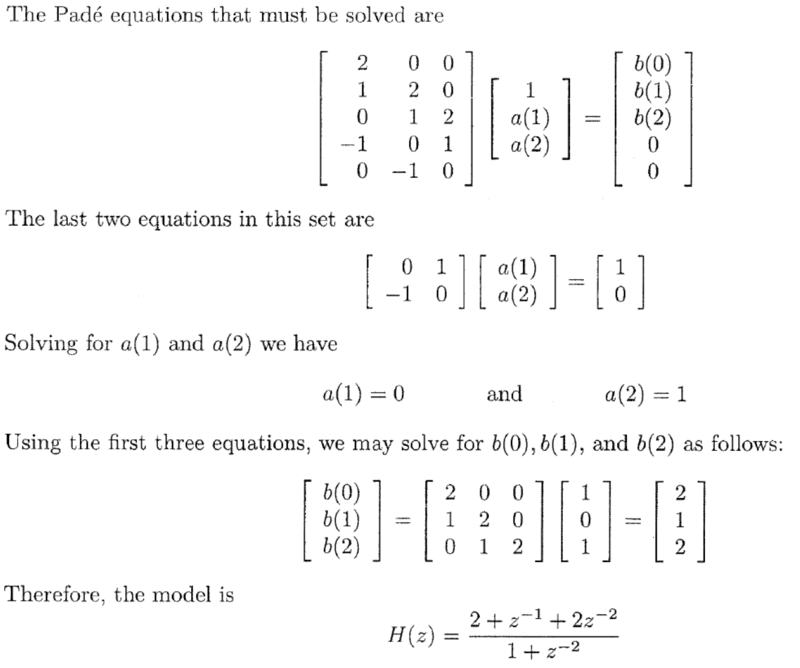 To solve for the a's I'd then have 3 equations for the vector $[1, a_1, a_2]^T$ which is impossible to solve. Where do I make the mistake? The problem and its solution is consistent with the Monson Hayes' book that describes Padé approximation. Your mistake is that you've taken $p=2$ but $q=3$ which is wrong. Correct is $q=2$ and there are 3 unknowns in $b[k]$ , that the problem defines a second order system , i.e, $a[k] = [1, a_1, a_2]$ and $b[k] = [b_0, b_1, b_2]$ , according to the book. Since there are $p+q+1 = 2+2+1 = 5$ (that +1 is for $b_0$) unknown coefficients in the system transfer function $H(z)$, then from its impulse response $h[n],$ only the first 5 samples will match to the data $x[n]$ for $n = 0,1,2,3,4$. And from the given solution as you can see there are 5 equations for 5 unknowns, of last 2 is used to solve for the unknowns $a_1,a_2$ and the first 3 used to find $b_0,b_1,b_2$. The data set used is the $x = [x_0, x_1,x_2,x_3,x_4] = [2,1,0,-1,0]$. Note that for the first two equations $x(-1)$ and $x(-2)$ are implictly referenced, which are assumed to be zero for the causal modeling. Not the answer you're looking for? Browse other questions tagged approximation or ask your own question.